"Enter the world of specialised warfare, the world of Global Operations." 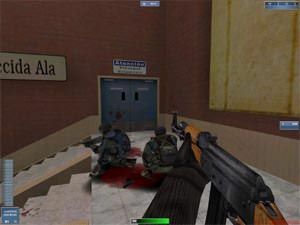 Global Operations a first person shooter (FPS) from Barking Dog Studios. Unlike most FPS games, the makers of Global Operations have decided to go the route of realism instead of Hollywood action movie where the hero is unstoppable. The game is more like Blackhawk Down than Arnold Schwarzenegger's Commando. Global Operations is a stand alone and team based first person shooter. My first reaction to this game was that it was Commandos (the game) crossed with a FPS as you can choose what kind of character you want to play. The characters are Commando, Recon, Sniper, Medic, Demoman, Heavy Gunner and VIP. Each character has a certain speciality such as speed, armour and speciality items plus their own unique ability such as being able to heal or snipe. The stand alone version of the game has a number of missions. For each mission that you complete, your characters are given money for performing certain duties in combat. For example, the commando receives $300 per head for eliminating enemy, whereas the Medic receives $200 for reviving a team mate or healing an ally. Everyone receives money for eliminating hostiles but those who are "specialist" killers receive more money for doing this. This cash then lets you buy more equipment. There are thirteen different conflict zones that range from the harsh conditions of Mexico to the deadly cold Antarctica. The Mexican mission involves your special forces team eliminating the powerful drug cartel Gallardo. Whereas the mission in Antarctica involves eliminating an armed group that has breached the Krongen Corporation Biotech Research Facility. This group is trying to steal a miracle vaccine known as PRO-C5. Your mission is to eliminate this force and recover the stolen vaccine. The stand alone missions in Global Operations is quite diverse which is guaranteed to give the player a wide range of playing environments. There are over 32 different weapons in the game and over 8 specialised equipment such as armour, thermal vision and C4. The developers at Barking Dog have modelled all weapons on actual real-life weapons and these include real sound effects. The attention to detail is quite amazing and nothing has been left to chance. The game itself starts with an impressive CGI cinematic of an elite special forces team raiding an enemy stronghold. This introduction helps set the mood of the game and gives you a perspective of what the game is all about. Global Operations uses a slightly modified version of the Lithtech 2.5 engine which has been pushed to the max by the developers at Barking Dog Studios. 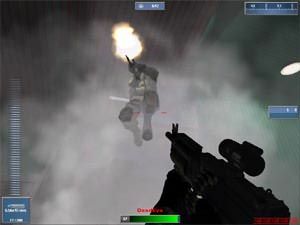 The Lithtech engine is a little dated in terms of modern FPS games such as Medal of Honour or Return to Castle Wolfenstein as many of the objects in the game have a "squarish" feel to it. However, to get over the limitations of this particular engine, the developers have really pushed the detail on all textures in the game. The characters in the game all look sensational and move with uncanny realism, thanks to the extra polygon count and detailed textures. The down side of this is that you need a fairly powerful PC to run this game at full detail. To give you an idea of how powerful this game is, it was reviewed on a P3 with 320meg of ram and a GeForce 2 MX and most levels of the game ran exceptionally smooth with the occasional pause on a resolution of 800x600x32. The ambient sound effects of this game helps keep you on edge while playing this strategic shooter. The only down side of the game was the music or lack of music. Developers should realise that music does help with game-play, especially games set in an action genre. Apart from the fairly poor music score, the sound effects such as the enemy, radio talk and weapons fire was all perfectly done. This game also supports online play where players can join games of up to 24 people and engage in various different combat situations. 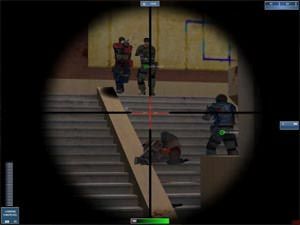 The online aspect of the game was extremely fun and you could join the special forces, peacekeepers, terrorists, rebel groups or guerrilla forces and everything is based on actual events. Gamers that have access to broadband will have a huge advantage to those who still run internet access on 56k modems. The link with a 56k modem is good but it does suffer from slowdown every now and then, no matter which ISP you are currently running. Fortunately this game also supports TCP/IP access for LAN use which great news for gamers who love their LAN parties. As with most EA games on the PC, the presentation is quality all the way. The game itself comes with a beautiful illustrated box of Global Operations, a 36 page manual, installation guide and a registration card to receive freebies. The in-game menus are easy to navigate and you can immediately get straight to the action. In conclusion, Global Operations is an extremely well designed game with only a few glitches that do not take much away from game-play. 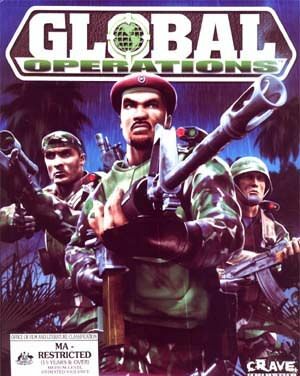 With the glut of First Person Shooter on todays market, I would recommend Global Operations to all fans of this genre. The reason for this is that Global Operations has extremely good replay value, not to mention the endless potential of internet or LAN play. Make sure you check this game out at your local Software Store.